RDKPRO | RDKPRO Sealing | Asphalt Seal Coating | Asphalt Sealing Services | Asphalt Crack Repair, Delmont, PA.
RDK Asphalt Seal Coating - Our Home on the Web! 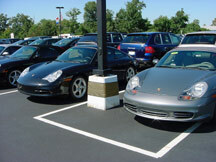 Parking Lots and Driveways provide the first impression visitors have of your business or home. Cracked, faded, or falling apart - what is your driveway or parking lot saying about you? RDK not only keeps your driveway or parking lot looking like new, asphalt sealing services can double or triple the lifespan of your asphalt at a fraction of the cost of replacement, overlay, and repair. Contact RDK Asphalt Seal Coating today about a FREE ESTIMATE. But you don't just want the job done right at a fair price, you want the entire experience to be hassle free, handled by professionals and providing that extra value: Peace of Mind. At RDK, we pride ourselves on being the best. As a result, our customers get nothing less. We use only the finest Sealmaster® and Innoplast™ products. We guarantee a return phone call within 48-72 hours. We provide you with a prompt, honest market price for your driveway or parking lot at no cost to you. "We treat your asphalt like it is our own." When RDK Asphalt Seal Coating acquires your business, we will take every step to ensure your future patronage. We will give you the very best products and apply them professionally, treating your property as if it were our own. To bring you this caliber of product at these competitive prices, we have to rely on our satisfied customers to spread the word. With the majority of our customers being repeated business, our sales and advertising dollars can be kept low, thus providing our customers with our lowest possible price. Sunlight (UV radiation) breaks down the asphalt, weakening it and loosening the top surface. You notice the first stages of this as your asphalt turns over time from black to gray. But the process continues as the surface looses its flexibility and begins to crack and break. Other culprits are oil and gas spills from the vehicles that park on your asphalt lot or driveway. 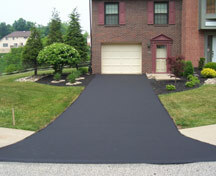 Without an asphalt sealer, these chemicals help break down your driveway even faster. Contact RDK today and ask about our asphalt sealing services and maintenance program. RDK Asphalt Seal Coating, located in Delmont, PA, serves all of Westmoreland County and many surrounding communities, including: Apollo, Blairsville, Connellsville, Derry, East Pittsburgh, Greensburg, Hempfield Township, Irwin, Jeannette, Latrobe, Ligonier, McKeesport, Monroeville, Mount Pleasant, Murrysville, Penn Township, New Kensington, North Huntingdon, Scottdale, White Oak, Youngwood, and the eastern half of Allegheny County. Not sure if we serve your area? Please call us today at 724-468-5956.
and many surrounding communities, including eastern Allegheny County.